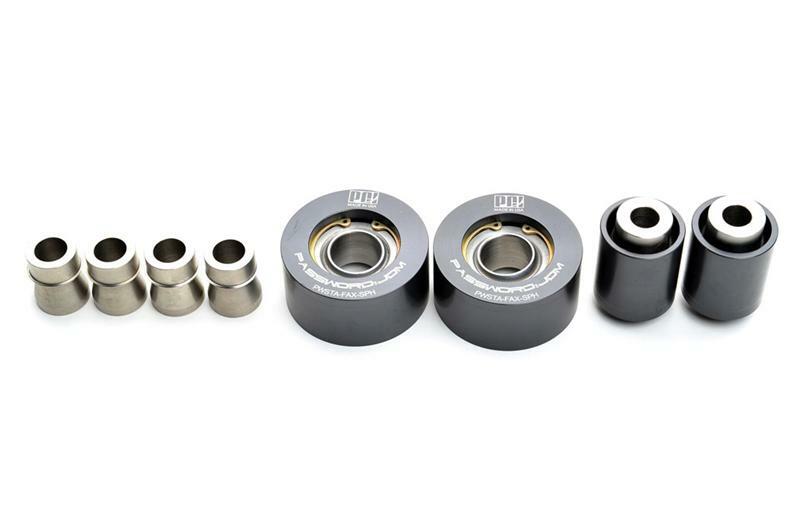 Eliminate wheel hop and maximize castor for increased high speed stability with the Password:JDM / PCI (Pro Car Innovations) Front LCA Spherical Bearing Kit! Like any spherical bearing that is to be used in a suspension system, the reason is to eliminate deflection. Rubber or urethane bushings will deflect (compress) under load leading to unwanted camber and toe changes. The more modified the suspension, engine, brakes, bigger stickier tires all lead to higher suspension loads thus more deflection and unwanted camber and toe changes. This makes the car unpredictable and unstable at high speeds and less responsive to driver input. Eliminating deflection on the front lower arm is very important to the handling of your car; the front lower arm carries the most loads of all the control arms under braking, accelerating, cornering, and launching. This product will have the same effect as traction bars, by reducing or eliminating wheel hop. Only by using a spherical bearing at this very critical part of the suspension can all deflection be eliminated. The Password:JDM / PCI spherical bearing kit is offset to maximize castor for increase high speed stability and added camber on turn in. The bearing housings are cnc machined from 6061 aluminum, and anodized. The spacers (high misalignments) are cnc machined from 4130 steel, and zinc plated. PCI warranties the product for up to 2 years from manufacturer defects. This product requires no maintenance. Recommend inspection every 6 months or 15000 miles by lightly hitting the arm with a rubber hammer to check for bearing play. There should be no play or noise. Early detection of play will prevent damage to the aluminum housing and spacers. Bearings can be replaced if needed, snap ring pliers are required for removal of the bearings. Over 100,000 miles of on road testing has showed no need for replacing.